A month and a half after my fruitful exchange with Hugh Hendry of Eclectica in London, in which we essentially traded our ideas on Deflation and Sovereign Debt, the UK has moved to quantitative easing and triggered a massive rally in long-dated UK Gilts. Hats off to Hugh, especially for his personal holdings of War Bonds, which moved big on this news. Of course, the UK is still on pace to issue more Gilts than they intend to buy. So, this adds an extra touch of absurdity to the farce that is monetization. Monetization is not bullish for government debt. The function of monetization is to use government debt as the transmission mechanism for reflation. While there is no question monetization boosts the price of targeted securities in the short run, monetization proves that natural market demand growth for those securities has stalled. This is the certainly the case with UK Gilts, though the same principle applies to US Agency Debt, and, US Treasuries should the FED start to buy those as well. I liken monetization to a currency defense. Upward blips in price are triggered, as price continues its downtrend. Price sensitive buyers then use monetization to sell. Global sovereign debt, and yes, even senior sovereign debt of the OECD, competes with all other global assets for the same investment capital. As I laid out in my January newsletter, the current debt-deflation is actually no longer bullish for sovereign debt. Recessions are indeed bullish for sovereign debt. But collapses are not. And monetization is just another piece of the Collapse puzzle. Nearly all global assets since July of 2008 have been deflating against the US Dollar, US Treasuries, and Gold. There was an initial deflation against the Japanese Yen. That has reversed. And rightly so. Also, long-dated US Treasuries saw their price highs in December, and while assets continue to deflate against them on a relative basis, 2009 has seen price losses in US Treasuries. The problem is that the same dynamic affecting earnings and global trade have started to affect sovereign debt. For example, while most observers agree that Japan exports have collapsed, and these same observers equally agree that US consumption has collapsed, and moreover, agree that inward capital flow into US Treasuries this decade was largely composed of our own consumption coming back to us, they stop short of the obvious conclusion: there is less capital in the world to support our Treasury market. While assets can certainly continue to deflate across the globe, my question is as follows: Can the US Dollar and US Treasuries bear that load without breaking? My answer is no. Only if every asset on the planet, in particular all other currencies and sovereign debt, were abandoned. And even in such an extreme event, there would be an endgame to such a dynamic. After all, as of 2007 we know that US funding needs were already sucking up most of the world’s available capital. And we know much of that capital was actually just credit. In a collapse of the kind we are experiencing now, however, the future is canceled as the system both behaviorally and structurally can no longer make plans for it. Production is closed immediately. Labor is let go at a hyper rate. The collapse has started out in textbook fashion with a demand crash, and the result has been what I call a petite deflation. The petite deflation feels strong, because of the rate of change. This time around, with the global credit bubble having grown to such immense proportions and with global populations running above, not below, carrying capacity we are at risk of actually not being able to downshift demand enough to outrun the price/incentive levels that were already creating risk in supply–principally in food and oil. 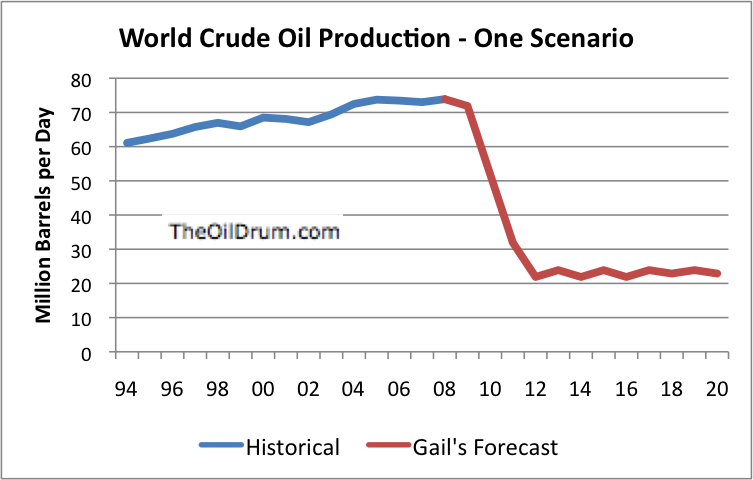 Specifically with regard to Oil, The Oil Drum has an excellent post up as of last week called Where Is Oil Production Headed? : An Adverse Scenario. This post looks at the prospect of an oil production crash as a result of of the current financial crash. When I saw the second chart in this post, it crystallized my current thinking. I saw the chart not merely as a portrait of a production crash in oil supply. But, in addition, a picture of a hyperdeflation–in which all assets deflate against scarce oil. When a banking system is sound, when there is political stability, and when the central bank is fearsome, then a paper currency generally triumphs over gold for a whole host of reasons, convenience and systemic functioning being paramount. In this case, Paper beats Rock. But when a banking system is not sound, when the central bank has been irresponsible, and when financial crisis foreshadows political crisis, then Rock starts to take a pair of Scissors to Paper. Generally, this process is currently underway. However, the US Dollar behaves as though it were still on the gold standard, with a fearsome central bank and solid banking system at its core. None of these are the case. This is why I conclude that should the current deflation continue, it will eventually take out the US Dollar and US Treasuries. I suspect the signals for this outcome are already present in the US Treasury market’s inability to go higher (in price) or to keep any gains from recent rallies. While I grant that there are some structural forces also, behind US Dollar strength, the situation with global trade and the collapse of our own consumption will eventually take their toll. Most of the current dynamic can be explained behaviorally, as the world rushes into dollars in a kind of mass recapitulation of the post-war US superpower paradigm. The amount of strength being projected onto the US Dollar and US Treasuries however cannot be matched or sustained by the rot taking place underneath. The cash flows that matter, from the US economy into Washington, are collapsing. The cash flows behind the US Dollar and US Treasuries are dying. The question then becomes which assets will survive the endgame of global deflation, should that story play out to its awful conclusion. My answer, based not on belief, but on the historical study of financial crises, is gold. But to gold we must also consider adding oil. Not as money, but as a store of value.